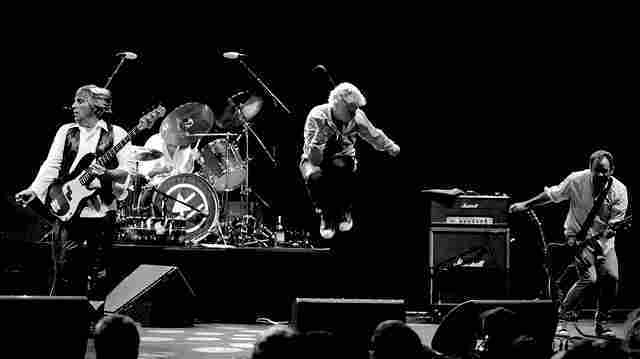 Of all the bands that have re-formed in recent years, Guided by Voices' return in 2010 felt inevitable. Let's Go Eat the Factory fits right in with the band's vast repertoire. Guided By Voices' "classic" lineup from 1993-96 re-formed in 2010. Of all the bands that have re-formed in recent years, Guided by Voices' return in 2010 not only seemed the least surprising; it felt inevitable. After all, frontman Robert Pollard never truly went away. Pollard officially disbanded the group at the end of 2004 following its "final" album, Half Smiles of the Decomposed, and a "farewell" tour. But in the seven years since, the impossibly prolific rocker has released 13 (!) solo recordings. Even for the most devoted of fans, it can be hard to keep up. Perhaps the most surprising detail in GBV's return is the reunion of the band's so-called "classic" lineup from 1993 to '96 — including Mitch Mitchell (guitars), Greg Demos (bass), Kevin Fennel (drums) and most notably multi-instrumentalist and co-writer Tobin Sprout, who left in '96 after a reported falling-out with Pollard. Though it spanned only a few years, this era produced arguably the band's best work, so by reuniting, Guided By Voices looks to be trying to strengthen its legacy after a long absence. The group originally got back together last year for a Matador Records anniversary concert, but that soon turned into a full-on reunion tour. Now, after touring behind older material, Guided by Voices finally has a new record, Let's Go Eat the Factory, an album of short, lo-fi pop songs that fit right in with the repertoire that preceded it. Let's Go Eat the Factory, out Jan. 1, is, for better and worse, a prototypical Guided by Voices album — it's 42 minutes long and has 21 songs, with the shortest ("The Things That Never Need") clocking in at less than a minute. The longest, the four-minute "We Won't Apologize for the Human Race," lasts an eternity by comparison. Robert Pollard never ceases to have another 20 new ideas in his back pocket, and he tends to write and record so quickly that these potential-rich nuggets are abandoned before they can be further crafted, let alone earn a second verse. As a result, many of his records, both with GBV and solo, can be inconsistent. Still, while Let's Go Eat the Factory is less a complete album than the latest batch of songs, there's plenty to like — a melodic hook, a lyrical phrase, a killer guitar riff, some grungy power chords. The strongest songs feel the most developed: There's "Laundry and Lasers," a brash, fuzzed-out banger; "Spiderfighter," a rocker that shifts to a soft piano ballad; "Old Bones," a haunting pop song accompanied by synths and keyboard strings; and "Waves," a droning shoegazer with muffled voices and thrashing guitars, but also the album's most sonically interesting track. Other great short songs could certainly have been fleshed out: "My Europa," with its dreamy twang, and the jangly "Chocolate Boy," which is easily the record's catchiest song. While Let's Go Eat the Factory may fall short of fan expectation and living up to the magic of Guided by Voices' best work, it's at least an encouraging step. Like so many GBV and Robert Pollard albums, this collection is a snapshot of where the band is at this exact moment; some stuff works, some doesn't. But it certainly succeeds in capturing the immediacy of Robert Pollard and company's creative process. All that said, they're hardly leaving us much time to dwell on any one song too long. True to form, Guided by Voices plans to follow Let's Go Eat the Factory with a second record of new material in May 2012, while Pollard has yet another solo record of his own coming in March. They just can't help themselves.